One of the very first grooming habits I adopted at a young age, except for facial cleaning, was the daily application of eye lotion in order to care for the sensitive area around the eyes. I am not sure who taught me this lesson: my mother, a beautician, or an advice column in one of the women’s magazines. But I certainly got the message early on that proper and consistent care prevents the premature onset of wrinkles. The eyes require a regular grooming regimen, not only because of their delicacy but also because they mirror our inner reflection, revealing our intellect, emotions, will, temperament, personality, and, of course, age. No external treatment can overcome a desperate soul or utter exhaustion, just as a neglect of eye care cannot hide a warm and loving personality. Yet, applying moisturizer and other rejuvenating substances can help to produce a satisfyingly healthy and glowing effect. It is mostly for their eye products that I have stayed loyal to Lancôme. I have occasionally been convinced to try out another brand only to find out that nothing suits me quite as well as Lancôme’s eye cream treatments. I cannot however say the same for their Bi-Facil eye makeup remover, which I find too oily and which burns my eyes. The eye cream I used for the first few years was Rénergie Eye (Anti-Wrinkle and Firming Eye Cream), later moving to Rénergie Lift Multi-Action Eye ( Lifting and Firming Eye Cream), the version for the more mature women. 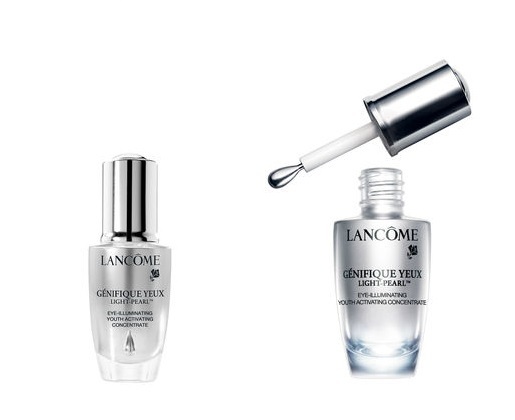 Recently, a beauty consultant in one of the department stores offered me a new product, the Génifique Eye Light-Pearl™, an "Eye-Illuminating Youth Activating Concentrate.” The applicator is designed with a unique massaging feature which rotates 360° and offers a delicate and precise massaging action around the fragile eye areas. They claiming that after 4 weeks of use, 78% of women found that their eye contour was visibly improved. I am not yet convinced about the results but the innovative engineering of the applicator is impressive. The cold metal and the 360° circular movement around the eyes create a nice feeling with just the right amount of pressure. I was recommended to use it in the mornings, and, already after a few first applications of the serum, I was happy to continue with this practice. Whether it will enter my faithful repertoire of eye products is yet to be seen, but I am certainly on the case. Finally, as mentioned above, I don’t like the Lancôme makeup remover, but I do recommend the Nivea’s Extra Gentle Eye Makeup Remover, which is cheaper, and does indeed stand behind the promise in its name.